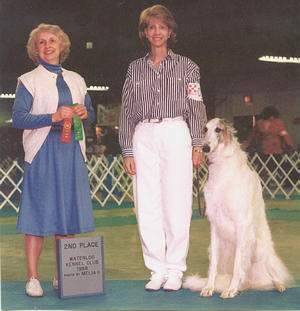 Borzoi - Nikki | Canine Training<p>by Mystic Moon, Inc.
Dual CH Ravenwolf Thunder Heart "Nikki"
"traditional breeds of Obedience Competition dogs"
The Borzoi was originally bred in Russia. Their job is to hunt wolves, and other large game, by running them down. They are known for a very sweet, soft temperament with people, and an aloof attitude toward strangers. It is very easy to over correct this kind of dispositionsuch as to ruin their desire to perform, or even want to be near you. Because of that temperament,you've never seena Borzoi in the Obedience Ring. 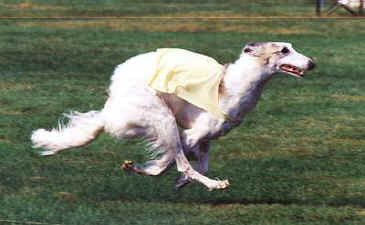 Nikki running at a field event for sight hounds. In his first 19 races, he was undefeated. Even when harassed or attacked on the field, he would ignore the aggressive opponent, and kept right on going.